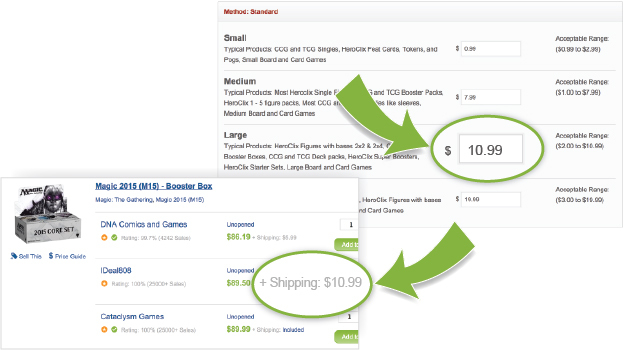 Set your shipping rates directly in your Seller Portal on TCGplayer for each product size and we'll display those shipping rates as part of the price on each product's page. This means we don't use the shipping rates provided to us from your eCommerce Provider for Domestic orders, and we will be able to provide instant shipping transparency to USA Buyers on all of our product pages. For Expedited Domestic shipping options, please enter your 3-4 business day shipping rates directly into your Seller Portal on TCGplayer. We will use the expedited shipping rates provided to us from your eCommerce Provider. With the lowering of shipping costs in the last year, many Sellers have become accustomed to tweaking their item prices to compensate for selling items in bulk and to be more transparent. To meet this transparency, we have adjusted our shipping options to be a flat rate. The Buyer will no longer be charged additional shipping fees behind the scenes based on the size of their order. This shipping transparency will bolster Buyer confidence by simplifying the purchasing process for all customers as well as boosting your store’s potential to increase sales! Example: You have a Small Shipping Cost of $0.79. (Magic/Yugioh Singles are now considered Small Products). 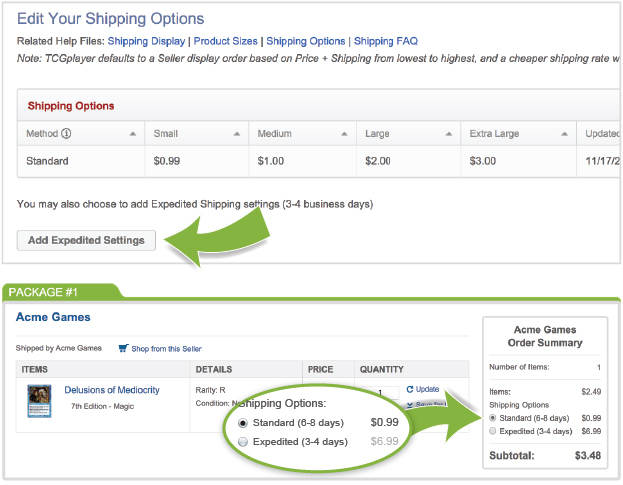 If a Buyer were to add 50 small items to their cart, a Shipping Cost of $0.79 would be applied for the entire order. When you go the post office to ship the package, the actual cost may be $2.29, which is $1.50 more expensive than your Shipping Cost. In this example, you have a few options for future orders. You can increase the Shipping Cost itself. Or, you can increase the Price of your items by $0.03 to cover potential shipping charges in the future. How do I set different shipping rates for different product sizes?